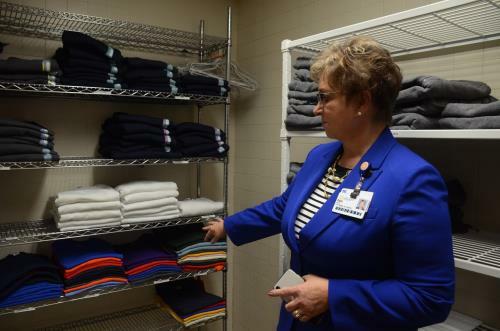 Erlanger Health System’s Compassion Closet is an employee-led initiative that provides patients in need of essential clothing items after they are discharged. Previously, when an Erlanger patient was discharged with little clothes, they were given paper scrubs. Recognizing that the lack of selection was less than ideal, Erlanger employees met to discuss what other options were available, which led to the establishment of the Compassion Closet. A closet that once housed supplies now holds shelves with new clothing items and shoes that are distributed when patients in need are identified by clinical staff. Bolstered by a $1,000 clothing donation from a local realtor group and a shopping cart’s worth of shoes from Erlanger physician Dr. L. Curtis Cary, the closet’s shelves have begun to fill up. Clothing items and shoes are being donated by Erlanger employees.